This equipment is special designed base on Italy and UK chocolate processing and handling technology. All machine is made of SUS304, high precision temperature sensor PT100 and controller. 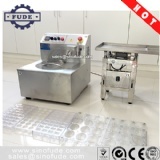 It is used for making good quality pure or compound chocolate depositing. CXJZ8&15 is desktop style chocolate depositor, easy to operate and place, CXJZ30 has vibration function, which can make better quality products.